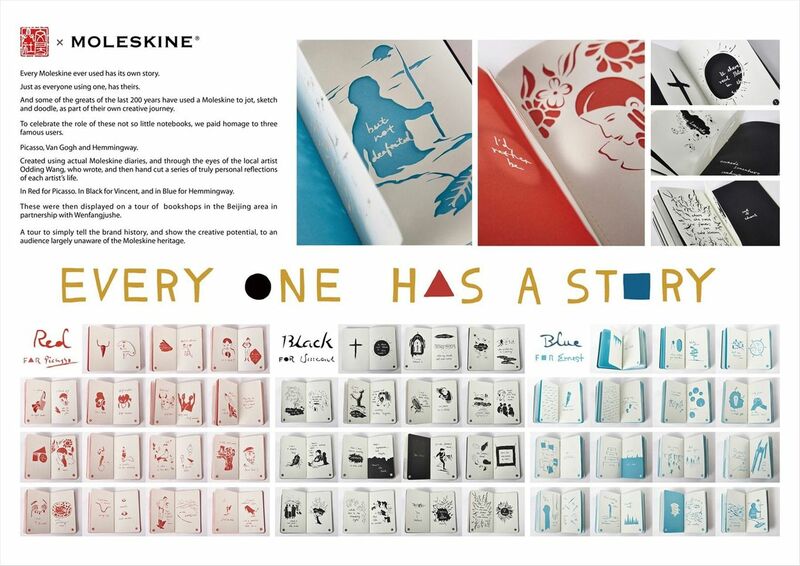 Every Moleskine ever used has its own story. Just as everyone using one, has theirs. And some of the greats of the last 200 years have used a Moleskine to jot, sketch and doodle, as part of their own creativejourney. To celebrate the role of these not so little notebooks, we paid homage to three famous users. Picasso, Van Gogh and Hemmingway. Created using actual Moleskine diaries, and through the eyes of the local artist Odding Wang, who wrote, and then hand cut a series of truly personal reflections of each artist's life. In Red for Picasso. In Black for Vincent, and in Blue for Hemmingway. These were then displayed on a tour of bookshops in the Beijing area in partnership with Wenfangjushe. A tour to simply tell the brand history, and show the creative potential, to an audience largely unaware of the Moleskine heritage.